Size of this preview: 800 × 518 pixels. Other resolutions: 320 × 207 pixels | 914 × 592 pixels. 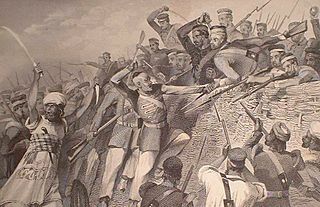 Credit: Ball, Charles (c.1860) The History of the Indian Mutiny: Giving A Detailed Account of the Sepoy Insurrection in India; and a Concise History of the Great Military Events Which Have Tended to Consolidate British Empire in Hindostan. London: The London Printing and Publishing Company. Page not numbered, among the illustrations at the beginning of Volume III. This page was last modified on 23 February 2017, at 21:22.